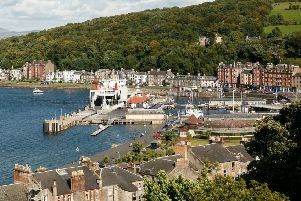 Argyll and Bute's islands will have a voice on the Scottish Government's new Island Transport Forum. Here CalMac's MV Loch Dunvegan is seen at the Rhubodach slipway at the north end of Bute. Argyll and Bute will have a voice on a new Islands Transport Forum being set up by the Scottish Government. The new organisation, set up to consdier strategic transport issues affecting Scotland’s islands, was unveiled by transport and islands minister Derek Mackay in Orkney this week. Mr Mackay was in Orkney to attend a meeting of the Islands Areas Ministerial Working Group - an organisation born out of the desire from Orkney, Shetland and the Western Isles for increased powers to shape their own future. No specific mention was made in this week’s announcement as to whether Argyll and Bute would have a voice on the new transport forum - but on checking with a Scottish Government official, we were told that the council would indeed be included. The Orkney meeting gave the working group’s members the chance to discuss consultation on the planned Islands Bill, which will be published for comment this summer. Following the meeting, Mr Mackay said: “The Scottish Government previously committed to looking at devolving more autonomy to our islands and decentralise decision making to those who live and work in these unique parts of Scotland. “We have taken a further two steps in that direction by announcing the Islands Transport forum today and our consultation on the Islands Bill which will be published this summer.